Grevillea ‘Golden Lyre’ is a hybrid originating from Fairhill Nursery in Queensland and a hybrid between G. formosa (widespread in the Kakadu area of the Northern Territory) and G. ‘Honey Gem’ (a Queenslad hybrid, common in cultivation). 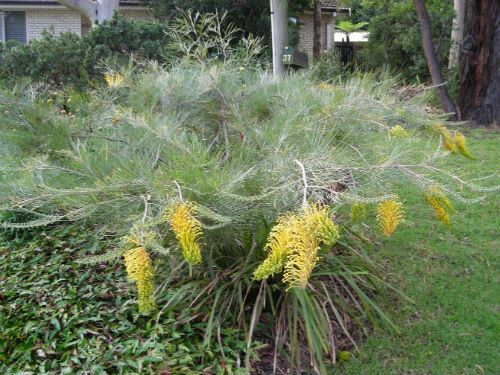 It was unfortunate that it was called ‘Golden Lyre’ as it cannot be registered with the Australian Cultivar Registration Authority as there is already a Grevillea ‘Poorinda Golden Lyre’ registered with them. Be sure of which one you are purchasing, as they are very different plants. I have been growing this plant for about five years, in my garden in the northern Sydney suburb of Westleigh. It is 1.5 metres high by about 3 metres wide and is stunning when it flowers during late summer and autumn. The many bright yellow terminal flowers can be up to 20 to 25 cms long and are literally dripping with honey. In warmer areas, north of Sydney (it will not tolerate a situation that is cold and receives winter frosts), it can grow to approximately 2 to 3 metres high by up to 4 to 6 metres wide if given full sun and some summer moisture. To prevent my plant from reaching any where near that size, I prune it back hard in early spring. 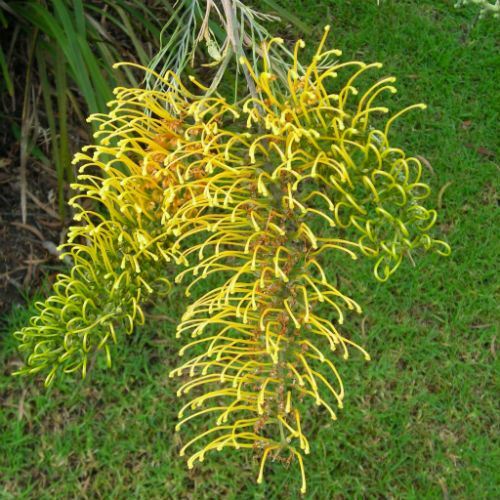 If you have the space and would like to grow a plant that produces stunning yellow flowers then Grevillea ‘Golden Lyre’ is the one. Grevillea: Charles Francis Greville (1749-1809) – one of the founders of the Horticultural Society.